J. B. & W. W. Cornell & Co.
J. B. 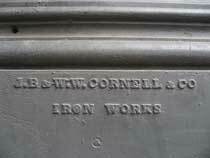 & W. W. Cornell "plain and ornamental iron works" was first listed in Doggett's New York City Directory dated 1847-48. The brothers were John Black Cornell (1821-1887) and William Wesley Cornell (1823-1870). They were the younger brothers of George Cornell (1807-1847) who preceded them in New York City. George Cornell had a partnership with Samuel B. Althause from 1828 to 1841. (For more on Cornell, Althause & Co. see the S. B. Althause page.) Around 1844, John B. and William W. Cornell seem to have joined their older brother who had a partnership with George R. Jackson (Cornell & Jackson, "housesmiths") at 199 Centre St. Then in 1847 J. B. & W. W. Cornell & Co. was formed. This company became one of the best known of all New York City iron foundries. J. B. & W. W. Cornell were succeeded in 1870 by J. B. & J. M. Cornell, also extremely well known. Some of the history of the Cornell companies is outlined at cornelliron.com. This ad for J. B. & W. W. Cornell dates from 1857. This ad for J. B. & W. W. Cornell dates from 1868, and features an illustration of the foundry building at 135-143 Centre St. This ad appears in Guide to New York: Its Public Buildings, Places of Amusement, Churches, Hotels, &c., 1868, available as a google book. A biography of John B. Cornell appeared in The Architectural Record, Vol. 1, July, 1891, available as a google book. J. B. Cornell was born on Long Island, 7 Feb. 1821. He was placed as an apprentice with his elder brother, George, in New York to learn the trade of an iron worker, then in 1847 started his own business with his brother William W. Cornell. The business was originally located on Centre St. In 1859 a new foundry was built at the foot of West 26th St. William died in 1870, and John B. then took for his new partner, his own son, John Milton Cornell (1846-1934). John B. Cornell died 26 Oct. 1887. This ad for J. B. & J. M. Cornell dates from 1892, when the foundry was still located on Centre St. This ad for J. B. 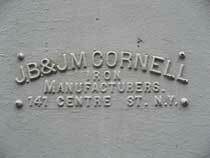 & J. M. Cornell dates from 1896, when the foundry was located at 11th Ave. on the corner of W. 26th St. The biography in The Architectural Record details a number of New York building for which Cornell provided cast iron. These included the A. T. Stewart store on Broadway between 9th and 10th Sts., Tiffany & Co. on Union Square at 15th St., the Arnold, Constable dry-goods store on Broadway, Fifth Ave. and 19th St., and the Domestic Sewing Machine Co. on the southwest corner of 14th St. and Broadway. Sarah Bradford Landau and Carl W. Condit, writing in Rise of the New York Skyscraper, 1865-1913 (1996), mention J.B.& W. W. Cornell in connection with the A. T. Stewart store at Broadway and 10th St. (1859-62): "With wrought-iron beams manufactured by the Trenton Iron Company and ironwork fabricated by the J. B. and W. W. Cornell Iron Works, the extended five-story emporium, with its vast 325,000-square-foot floor area, was the largest iron-framed building in the world aside from the London Crystal Palace." 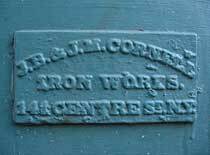 The same authors credit the Cornells with supplying the steelwork for the St. Paul Building at Broadway, Park Row and Ann St. (erected 1895-98; now demolished): "The steelwork for its modified skeleton construction was supplied by J. B. & J. M. Cornell..."
During his lifetime John B. Cornell secured numerous patents relating to the iron industry. Some of the earliest of these were "Metallic Slat-Shutter" (patent 11,663 dated 12 Sep. 1854), "Vault Cover" (patent 14,281 dated 19 Feb. 1856), "Continuous Sheet-Metal Lathing-Surface" (patent 14,854 dated 13 May 1856), "Sidewalk-Pavement" (patent 17,138 dated 28 April 1857), "Vault-Cover" (patents 17,198 and 17,199, both dated 5 May, 1857), "Metallic Roofing for Subterranean Vaults" (patent 18,677 dated 24 Nov. 1857), and "Metallic Window-Shutter" (patent 19,348 dated 16 Feb. 1858). The text of patent 14,281 "Vault Cover" can be read at glassian.org. Glassian offers 5 additional John B. Cornell patents relating to vault lights. On his death in 1870 William W. Cornell had the following obituary notice in the New York Times, 18 March 1870, "Today we chronicle the death of W. W. Cornell, of the firm of J. B. 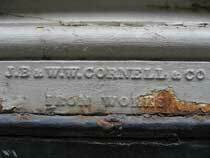 & W. W. Cornell, iron-founders, in this City. He died yesterday at his residence at Fort Washington, aged fifty years, after an illness of several days' duration. Mr. Cornell, who was one of the self-made men of our times, was born in the western part of this State, and came to New-York when he was twelve years old. His first employment here was as a blacksmith's apprentice. Fortunately for the lad his master interested himself in the boy's religious welfare, by taking him to the Jane-street Methodist Episcopal Sunday-school. Here the young Cornell became a convert, joined the Jane-street Church, was connected with it for many years, and for a long time was afterward Superintendent of its Sunday-school. 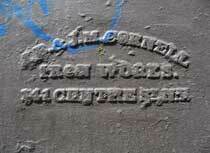 Comparatively early in life he established his brother in Centre-street, the iron-foundry bearing his name. With his increase of wealth his liberality kept pace, and he regularly bestowed a certain portion of his annual income in religious charities. He was also especially known to be the friend of struggling poor young men, remembering that he was like them once. His connection with the Sunday-school and Missionary Society of this City is well known to most of our readers, as its President and liberal donor... Mr. Cornell's income amounted to about $215,000 a year. He had a fine house, No. 41 Grove-street, and his residence at Fort Washington, which he recently purchased. He leaves a wife and four children, two of whom are married." The following notice of J. B. Cornell's death appeared in the New York Times, 27 Oct. 1887, "John B. Cornell, head of the well-known iron firm of J. B. & J. M. Cornell, died yesterday at Lakewood, N. J., after an illness of several months, including a severe attack of bronchitis last week. He was 66 years old and a millionaire. He was born at Far Rockaway, and had always remained in or near the metropolis. He was trained in the iron foundry of his brother, whose firm was Cornell, Althonse [sic] & Co. 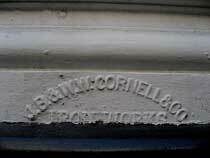 In 1847 Mr. Cornell and his brother William embarked in the business under the firm name of J. B. & W. W. Cornell. William died in 1870, and the firm of J. B. & J. M. Cornell was formed. Mr. Cornell was Trustee of the Broadway Savings Bank, a member of the Methodist Episcopal Church, being President of the Board of Trustees of Drew Theological Seminary. His gifts and charitable contributions amounted to a very large sum. He leaves a widow and seven children." The following described the funeral of J. B. Cornell (New York Times, 30 Oct. 1887), "The funeral of John B. Cornell, the millionaire iron merchant, who died on Wednesday at Lakewood, N. J., took place yesterday forenoon, at St. Luke's Methodist Episcopal Church, Forty-First-street near Sixth-avenue. It was very largely attended, the church being packed to its utmost capacity. A delegation of about 1,500 of Mr. Cornell's employes viewed the body after the services..." A long list of attendees included James J. Burnett. The account closed with, "The coffin was covered with plain black cloth, and had upon it a wreath of white roses and a cluster of pansies. The burial book place in Greenwood in the afternoon." John B. Cornell's memorial at Green-Wood Cemetery, Brooklyn, reads, "John B. Cornell / Born / At Far Rockaway, L. I. / February 7, 1821 / Died October 26, 1887. / Having Served His Own / Generation He Will Of / Course [Fall On?] Sleep" The reference seems to be the verse in Acts 13:36, "For David, after he had served his own generation by the will of God, fell on sleep, and was laid to his fathers, and saw corruption." Cornell's memorial has four sides with inscriptions for himself and then one each for his three wives. The wives were (1) Elizabeth / Died Sept 18, 1842 / Aged 19 years; (2) Catherine / Died March 26, 1854 / Aged 33 years; and (3) Minnie Reid Sherman / June 26, 1828 / December 22, 1922. The 1880 U. S. Census (non-population schedules) recorded J. B. & J. M. Cornell, Iron Foundry. The company owned $500,000 in capital and raw materials worth $445,000. They employed as many as 1327 workmen, including 1318 males above the age of 15, and they paid $422,530 in annual wages. The ordinary work day was 10 hours, and a skilled mechanic was paid $2.55 per day. They were in operation 12 months of the year. The plant used four boilers for 13 steam engines with a total of 255 horsepower. The value of the previous year's production was $1,500,000. In 1896/97 J. B. & J. M. Cornell took over the iron foundry at Cold Spring, N. Y. on the Hudson River. The foundry was known as the West Point Foundry Works. These facilities are discussed in the magazine, The Successful American, Vol. III, No. 4, April 1901, p. 202, which also illustrates the extensive works at this location. Cornell's facilities at Cold Spring are mentioned in this ad from the Building Trades Employers' Association Bulletin, March, 1905. These facilities are also mentioned in their entry in Sweet's Indexed Catalogue of Building Construction, 1906. In addition to his own sons, John Milton Cornell (1846-1934) and Henry Meigs Cornell (1865-1900), John B. Cornell was succeeded at J. B. & J. M. Cornell by Birdsall Cornell (1830-1905), a son of his elder brother, George Cornell (1807-1847). On Birdsall Cornell's death in 1905, the following appeared in the Boston Evening Transcript, Tuesday, 25 July 1905, p. 16, "Mr. Birdsall Cornell, 75 years old, of Montclair, NJ, died on Sunday at Morristown. He was a member of the firm of J B & W W Cornell Iron Works in New York; also a member of the Society of Mechanics and Tradesmen, American Institute, a fellow of the Society of Designers and prominent in St. James's Episcopal Church in Upper Montclair." 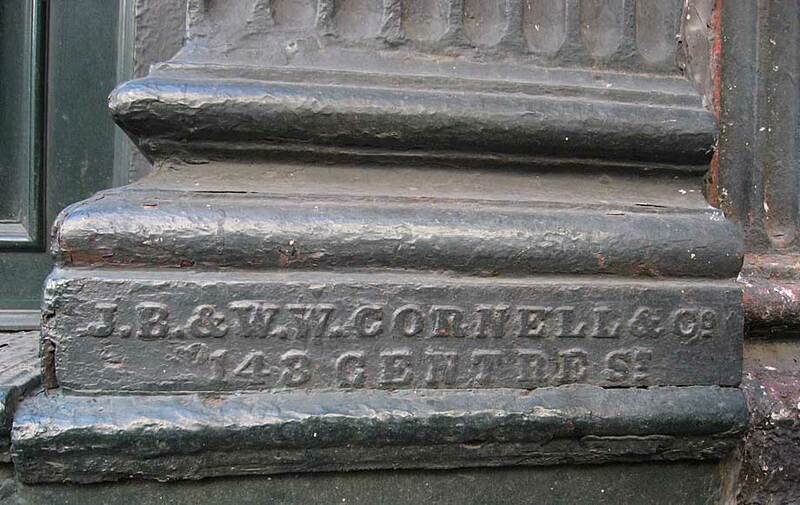 The third generation of Cornells connected with the company consisted of John Milton Cornell's sons, Irwin Hewlett Cornell (1881-1963), Milton Longacre Cornell (1884-1958), and John Black Cornell (1885-1963). Milton Longacre Cornell received the following obituary in the New York Times, 6 Nov. 1958, "Milton Longacre Cornell, industrialist and a former trustee of Columbia University, died yesterday in his home at 4 Summit Place, Malba, Queens, after a long illness. He was 74 years old. Mr. Cornell had been president, board chairman, treasurer and advertising manager of the Cornell Iron Works, Inc., Long Island City, Queens. The company, which manufactures metal rolling doors for industrial purposes and ornamental metal grilles for use as store fronts in schools and elsewhere, was founded in 1828. Concurrently with his industrial career, which began in 1905 as a draftsman for the family concern, Mr. Cornell had been identified widely with Columbia. He received a civil engineering degree from the School of Engineering and was president of the combined 1905 class of the school and Columbia College until his death..."
On his death in 1963 John Black Cornell (the second) was described as follows in the New York Times, 6 Nov. 1963, "Roslyn Harbor, L. I., Nov. 5 - John Black Cornell of Bryant Avenue, chairman of the board of the Cornell Iron Works in Long Island City, Queens, died sunday at the home of a daughter, Mrs. Philip MacPhail, in Boulder, Colo. His age was 78, Mr. Cornell served for more than 50 years as head of the company, which was founded by his great-grandfather in 1828. He was born at Fabyan, N. H., a son of John Milton and Sarah Longacre Cornell. He was a great-grandson of James Barton Longacre, engraver for the United States Mint, whose daughter, Lydia - Mr. Cornell's grandmother - was, according to some accounts, her father's model for the Indian-head penny. Mr. Cornell was graduated from the Cutler School, New York City, in 1903, and the Sheffield Scientific School of Yale University in 1906. One of his early jobs with the company was to service the arm of the Statue of Liberty. The framework for the statue was supplied by the Cornell company. At that time sightseers could climb into the arm and it was Mr. Cornell's duty to make sure that the framework was in good condition. The arm was eventually closed for safety reasons. The company, which once provided the steel sleds on which General Ulysses S. Grant's artillery was pulled out of the mud at Vicksburg, Miss., and which produced the steel for the Sixth Avenue elevated structure, today manufactures rolling doors, ornamental grille work and other metal items." The Cornell Iron Works entry in Sweet�s Architectural Catalogue, 1917, reads, Cornell Iron Works, Manufacturers of Rolling Steel Shutters and Doors, 26th Street and 11th Avenue, New York, N. Y. Rolling Steel Shutters and Doors, Hand Chain and Motor Operated, for Residences, Office Buildings, Garages, Wharves and Piers, Warehouses, Elevator Shafts, Store Fronts and Buildings of all kinds. The Sweets 1917 article shows an installed Cornell Rolling Steel Door in Pottsville, Pennsylvania. By 1917 Cornell products included primarily rolling shutters and doors. The Cornell entry in Sweet�s Architectural Catalogues, 1933, reads as follows: "Cornell Iron Works, Inc. / Steel Rolling Shutters and Doors; Underwriters� Labeled Fire Doors and Shutters / Hand and Automatic Operation, Steel, Rustless Steel, Bronze, Aluminum or Zinc Slats; Float-over Doors, Overhead Acting; Rolling Grilles and Gates / 3610 to 3630 13th Street, Long Island City, N. Y. Telephone STillwell 4-3880, 3881, 3882. Cornell Improved Deep Arch Interlocking Slat Steel Rolling Doors and Shutters, handle, chain, crank, or motor operated, for wharves, piers, terminals, warehouses; freight platforms, elevator shafts, garages, store fronts, craneway openings, office buildings, interbuilding communicating doors, residences, hospitals, schools, power plants and a host of industrial and factory buildings." The Cornell logo was shown in the Sweet's article. The following was read into the Congressional Record by the Hon. Paul E. Kanjorski, 27 April 2001, "Mr. Speaker, I rise today to pay tribute to Cornell Iron Works, an outstanding company that has been in existence since 1828. Cornell, which moved to Northeastern Pennsylvania in 1965, began operations at its new, larger plant last month. ... The new plant is dedicated to Milton Keen Cornell, president of the company from 1969 to 1997 and father of current president Andrew Cornell. Cornell Iron Works is a quintessential American success story. George Cornell and Samuel B. Althause founded the company in 1828 in New York City. Over the years, the company grew and prospered, thanks in part to the patents secured by John Black Cornell for innovations such as a metallic surface for fireproof partitions that would support plaster, which enabled the construction of high-rise fireproof buildings. The company has contributed to landmark American projects by providing such items as circular stairs and ironwork for the Brooklyn Bridge, the iron base and stairways for the Statue of Liberty, and 8,000 tons of structural steel work for the Park Row Building in New York in 1898, at the time the tallest building in the world..."
Recently (Jan. 2013) found on Broadway near 81st St. was this modern iron work marked Cornell Iron Works. 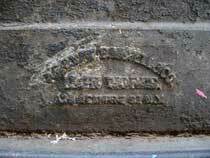 Coal chute covers manufactured by Cornell Iron Works are found on the Cornell manholes page. Vault lights manufactured by Cornell Iron Works are found on the Cornell vault lights page.